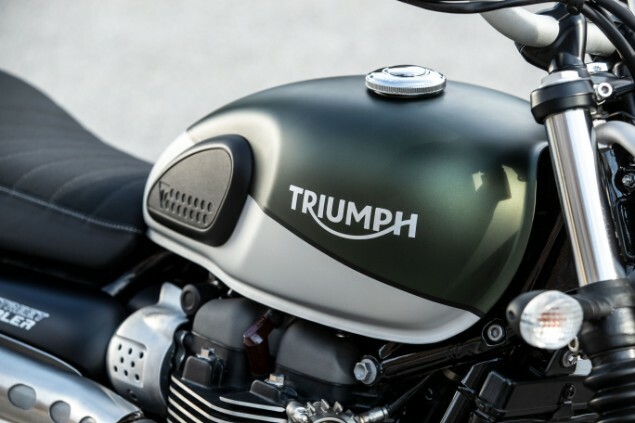 Just two years after Triumph launched the Bonneville Street Scrambler and it has become one of the most popular bikes in the range and there are a host of changes for 2019. The biggest change is one that is the same as that seen on the Bonneville Street Twin with a significant 18% increase in power from 55PS to 65PS from the 900cc liquid-cooled, parallel-twin motor. Not only is the power increased but the maximum revs have been increased by 500rpm to 7500rpm with engine internals including the cam cover, crankshaft, dead shafts and balance shafts and clutch all replaced with lighter items. The Bonneville Street Scrambler has a more rugged image than that of the Street Twin with which it shares a lot of common parts and it can trace that style of bike all the way back to the Bonneville T120TT and Tr6 ‘C’ models of the 1960s. 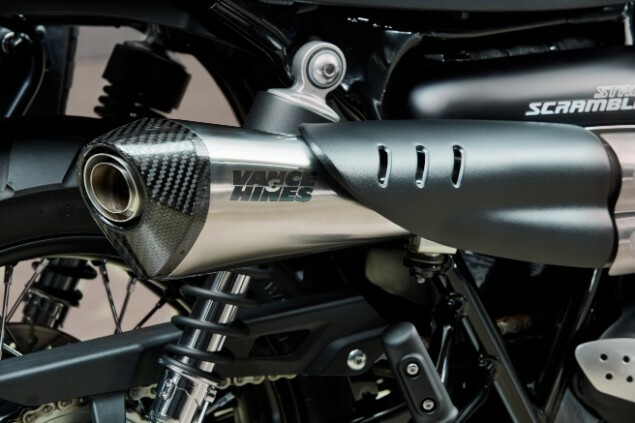 The main visual clues are in the larger diameter front wheel and the high-mounted exhaust silencer routing which was introduced to give increased off-road ground clearance. Like the Street Twin, the Street Scrambler gets a new Brembo four-piston front brake caliper for improved braking performance along with new front cartridge fork internals for a more comfortable ride. 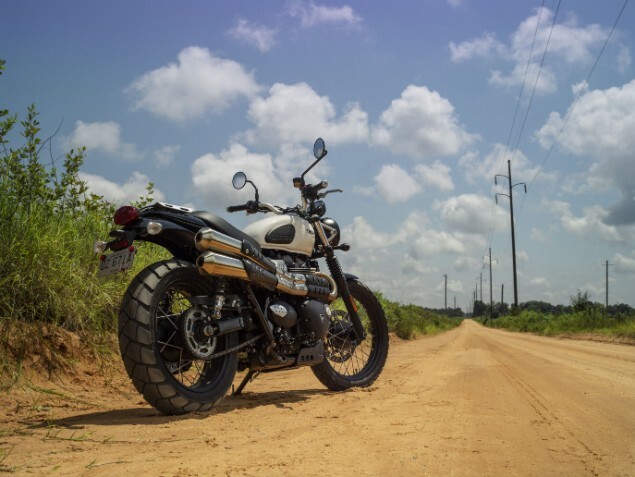 In keeping with the Scrambler image, the handlebars are set wide, the footpegs are moved forward and the bike has a 19in diameter front wheel to offer off-road riding control. There’s also 120mm of fork travel to soak up some off-road lumps and bumps. This front wheel size works with dual purpose tyres to grip both on the road and on light off-road surfaces. The front forks have now been mounted more widely spaced apart and this has meant the front mudguard has been reshaped to accommodate it. Road and rain riding modes are standard with these working to adjust the throttle and traction control settings and also work with the ABS to offer a level of safety in emergency situations. An A2 power restriction kit will be available for dealer’s t fit to allow those on restricted licences to ride the bike while they wait to pass their full licence at which point they can get the bike de-restricted. In terms of styling the bike gets new number-board side panel graphics, a new logo and upgraded instruments. A new more comfortable seat has been added and on the Street Scrambler, it gets a shape aimed at offering off-road riding capability.